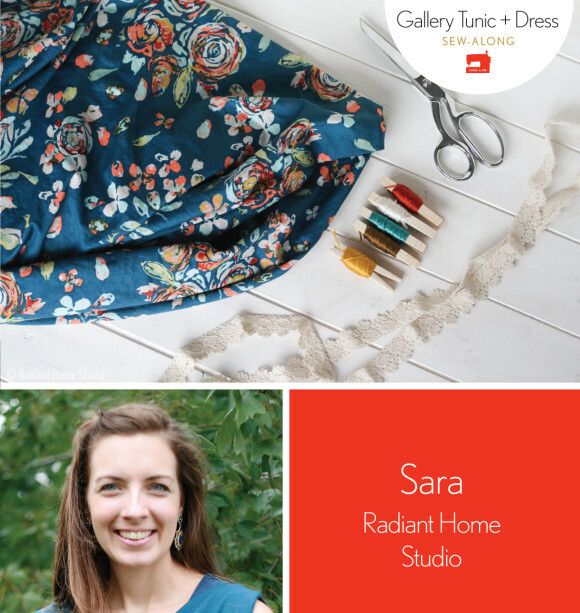 Have you finalized your preparations for the Gallery Tunic + Dress sew-along yet? Join along with your friends starting Monday. So far we have heard from four panelists: Carmen, Kristi, Lori, and Rachel. We have now come to our fifth and final panelist, Sara. Last year she stopped by with her fantastic sashiko embroidery tutorial. She’s back and here she is! Hi! I’m Sara, and I blog at Radiant Home Studio. I have 6 children ages two through ten. When I’m not homeschooling the kids, I spend my time sewing and designing. I enjoy sewing clothing for myself and the children, making bags and home decor items, and experimenting with artistic embellishments such as screen printing and embroidery. I’m using a floral voile print from by Maureen Cracknell for Art Gallery fabrics. I debated between making a pretty floral print top and plain linen one. Though I’d still love to make one with linen, this beautiful floral print was calling to me. I’ll be making View A, the tunic length top, with the full collar. I think this will be a great transition piece for my spring wardrobe. The fabric is lightweight and cool enough for warm weather, but the colors are more seasonally neutral and the top will layer well. The fabric has a little bit of a bohemian feel, so I’d like to incorporate some small embellishments to complement the style. I plan to include some lace accents and possibly some embroidery. My inspiration for embellishments tends to come as I’m in the middle of a projects, so I’ll make final decisions about these as I’m sewing. I’m excited to be a included as one of the panelists and I look forward to seeing what you all make with your Gallery Tunic + Dress pattern!